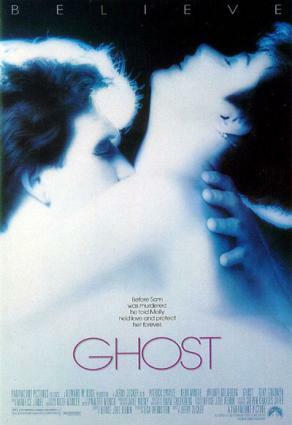 1990's Ghost has strong elements of suspense thriller, and moments of comedic gold, but if you asked most people to categorize it, they would tell you it's a love story. It's a bittersweet love story that can't have a happy ending, since one of the couple involved in the romance is dead. As Ghost opens, we are introduced to Sam Wheat (Patrick Swayze) and Molly Jensen (Demi Moore). Sam is a banker and Molly a sculptor, and they seem to have an idyllic life. Deeply in love, they've just moved in together into a funky yet upscale urban loft and are talking about getting married. But their plans are interrupted, torn apart in a shocking instant by an act of seemingly random street violence. Sam is shot by a mugger and finds himself standing on the street, watching Molly weep over his dead body. A ghost's lot is frustrating. Sam can't get Molly to hear him or recognize that he's still here, all he can do it watch her mourn. But one day when Molly is out, someone enters the loft. It's the man who shot him! The man searches the loft and is almost found by Molly when she returns. Sam follows the mugger and hears him make a phone call telling someone he didn't find it. Sam's death was not random street violence after all. Now Sam has to solve his own murder and protect Molly from whoever is behind it. But what can he do? None of the living can hear or see him. In frustration, Sam sees a sign for a storefront psychic and goes to see her. Enter the comic element of the movie. Oda Mae Brown (Whoopi Goldberg) is a fake psychic. Her mother and grandmother had the power, but she's putting on an act. She's never heard a dead person in her life. Until Sam. Oda Mae doesn't want to cooperate or have anything to do with a real ghost, so Sam has to haunt her. He keeps her up all night, singing "I'm Henry The Eighth" - badly. To shut him up, Oda Mae agrees to cooperate and take his message to Molly. Molly is initially skeptical, but through Oda Mae, Sam reminds her of enough personal details that she has to believe. But a trip to the police with the information about the mugger she gained from Sam crushes her belief when the cops pull out Oda Mae's extensive criminal record. Sam's efforts have been stymied. But now he's desperate, because he's solved the case. The man behind the mugger is his best friend Carl Bruner (Tony Goldwyn), whose money laundering for drug gangs had been about to be uncovered by Sam. And Carl is putting the moves on Molly. In the tense finale of Ghost, Sam has to save both Molly and Oda Mae from Carl and his henchman. Ghost was directed by Jerry Zucker and written by Bruce Joel Rubin. It received two Oscars, Best Screenplay for Bruce Joel Rubin, and Best Supporting Actor for Whoopi Goldberg.